Cranes 101: Enclosed Rail System Cranes | EMH, Inc. Enclosed rail system cranes are a popular solution within material handling. Enclosed rail system cranes are enclosed to significantly reduce the accumulation of dirt on the rails, ensuring that rolling always requires a consistent, easy effort. How easy do these aluminum enclosed rail system cranes roll? They typically have less than 1% rolling resistance. Enclosed rail system cranes are great for limited work space. As enclosed rail is lighter, enclosed rail system cranes add less stress to your building structure when mounted. EMH provides engineering to determine your best option among enclosed rail system cranes. EMH’s enclosed rail system cranes fall within our EMH AL SYSTEMS™ Aluminum Crane Rail System. EMH’s enclosed rail system cranes feature precise rail tolerances and smooth running trolleys, enabling manual operation of your enclosed rail system cranes when desired. EMH’s enclosed rail system cranes use extruded aluminum, provide maximum twisting resistance and high load capacity, and despite their light weight numerous T-slots making it easy to mount every kind of equipment. 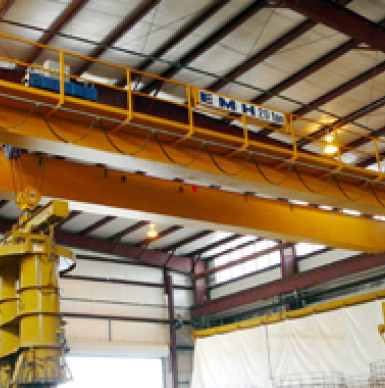 EMH’s enclosed rail system cranes are are surface treated, anodized and completely maintenance-free. All EMH’s enclosed rail system cranes are pre-engineered so that they are available for immediate shipping.